A business man was interviewing applicants for the position of divisional manager. He devised a simple test to select the most suitable person for the job. He asked each applicant the question, "What is two and two?" The first interviewee was a journalist. His answer was "Twenty-two." The second was a social worker. She said, "I don't know the answer but I'm glad we had time to discuss this important question." The third applicant was an engineer. He pulled out a slide rule and showed the answer to be between 3.999 and 4.001. The next person was a lawyer. 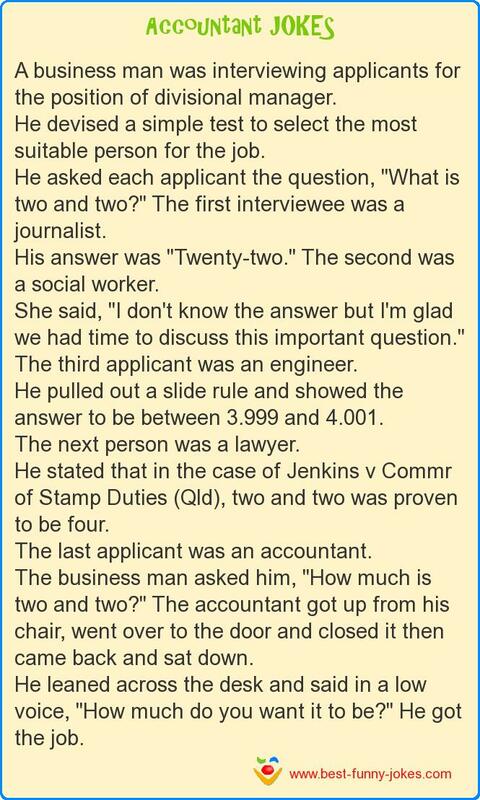 He stated that in the case of Jenkins v Commr of Stamp Duties (Qld), two and two was proven to be four. The last applicant was an accountant. The business man asked him, "How much is two and two?" The accountant got up from his chair, went over to the door and closed it then came back and sat down. He leaned across the desk and said in a low voice, "How much do you want it to be?" He got the job.